Rangoli Demo (in English) | Oshwal Association of the U.K.
East Area Oshwal Association held a monthly event on 24th October 2018 and were honoured to have Bijalben Shah to perform a demonstration of Rangoli. This event was held at St. John’s Church Hall, St. John’s Road, in Sevenking, Essex. The members started arriving in the hall with smiles on their face, and in the spirit of the arrival of the Diwali. They mingled with members and talked about the news of the area and health of the other members in the area who are not well. Everyone congregated and a prayer was started by the members to start the programme. Our Hon. Chairperson Mr Kishorebhai Haria gave his speech, welcoming Bijalben to come and demonstrate rangoli in East Area, and he gave details of the forthcoming Programmes in East Area and at the Oshwal Centre. Then the tasty dinner of Falafel, with hot tea and biscuits were served with the main meal and all enjoyed a very healthy meal. When the food is so tasty and delicious I think all are happier and also they look forward to coming again. Then, Bijalben started the demonstration of the rangoli explaining why Rangoli is done? 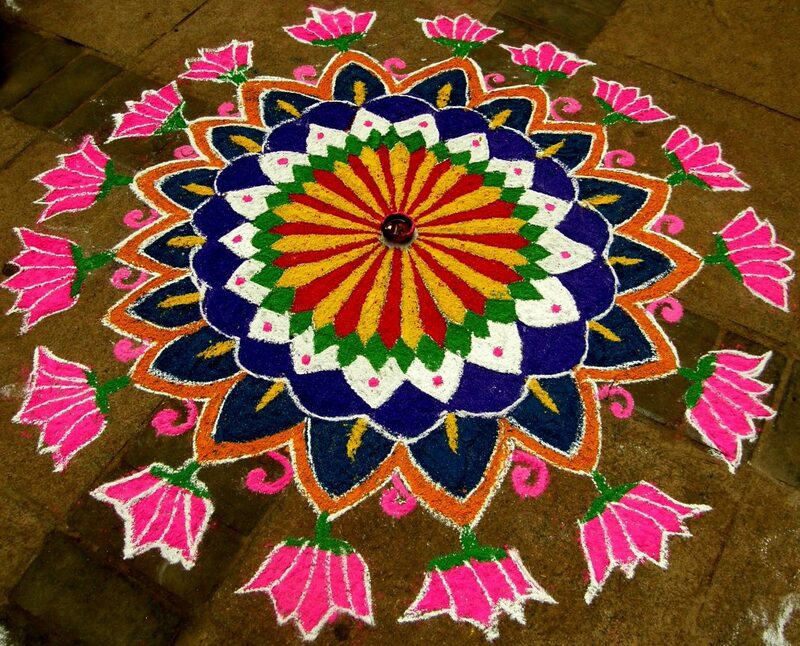 and what types of material can be used to do Rangoli? also explained the rangoli can be done with oil-based colours on slate tiles or roof tiles. She had brought the stencils so she can teach how to do rangoli with the stencils. All ladies got engulfed to do Rangoli whereas the gents started playing card games. No one got bored and everyone was enjoying. The evening passed so quick that it was time to go home. Everyone enjoyed the evening and was a worth evening to learn a lot. East area is thankful to Bijalben and to come and teach something which the members will be able to put in practice. We had a successful programme and wish more members come and support this programmes and this was another successful event in the East Area.